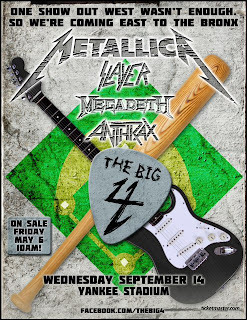 The Big 4 of thrash metal has now announced another US live date. On September 14, 2011 at Yankee Stadium Metallica, Slayer, Megadeth, and Anthrax will play their second live show on US soil. This comes as a followup to their successful California date on April 23rd. That was the first time that all of the bands had played together on their home turf of the United States which followed a series of successful stints playing festivals over in Europe. While most people were hoping for a full US tour, we only get a couple shows that leave out a majority of fans which cannot make those trips. There is always a glimmer of hope in the hearts of diehards that they will at least play a few more shows that allows more people to witness such an event, but I believe that this is it, no more shows after this. And I hope that I am wrong about that. If you are able to get out to the show definitely go to see these metal legends and pay homage to what they've helped create.